Visitors to the Galapagos Islands will hear their guides talk about three different types of animals and plants. 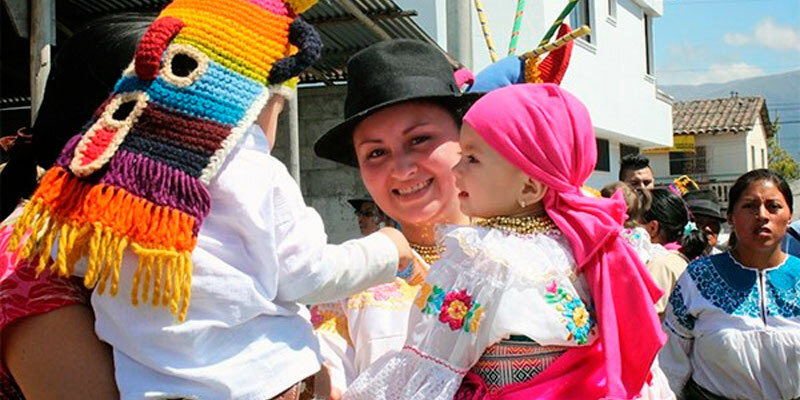 The terms used to describe them are endemic, native and introduced. What’s the difference? 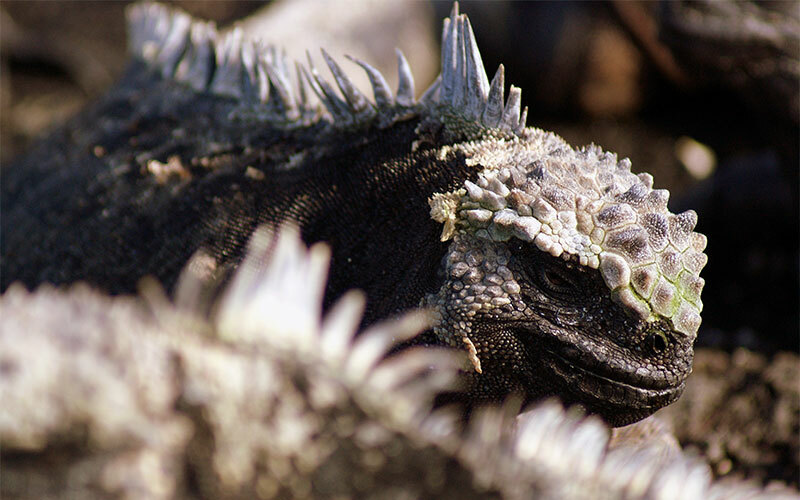 Endemic animals are only found in Galapagos: the marine iguana is one example. Native animals are found naturally in Galapagos and elsewhere: the Frigatebird is a good example. Introduced species are found in Galapagos because they were brought there by humans, intentionally or accidentally. The goat is an example of an introduced species. For obvious reasons, it’s the endemic species that people come to see! 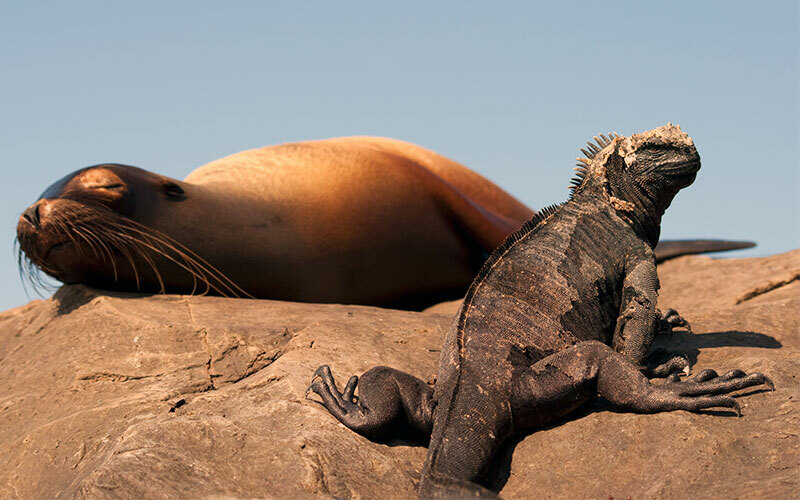 Here’s the scoop on endemic Galapagos species. 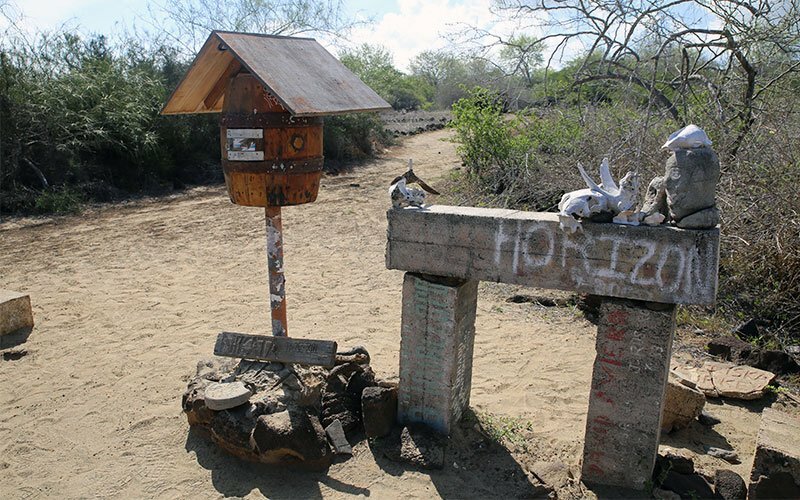 Every endemic Galapagos species took a different path to the islands ages ago. Animals such as iguanas, rice rats and tortoises are believed to have come from the South American mainland. The scenario is something like this: In a rough storm, some animals get flooded out of their homes and into a river, where they cling to a fallen tree or some other clump of vegetation. The river washes them out to sea, where they miraculously survive until they wash up on the shores of Galapagos. On the other hand, birds and bats could, of course, fly to the islands. Larger, flightless animals like sea lions and penguins likely arrived on the islands having drifted away from their homes in storms. Why are there so many endemic reptiles and so few endemic mammals? The answer has to do with how hard it is to get to Galapagos. A reptile, like a snake or a lizard, needs much less food and water than a mammal (at least short-term) and is less sensitive to strong sunshine. Because Galapagos is so far away from the mainland, only the fittest species can survive the journey. 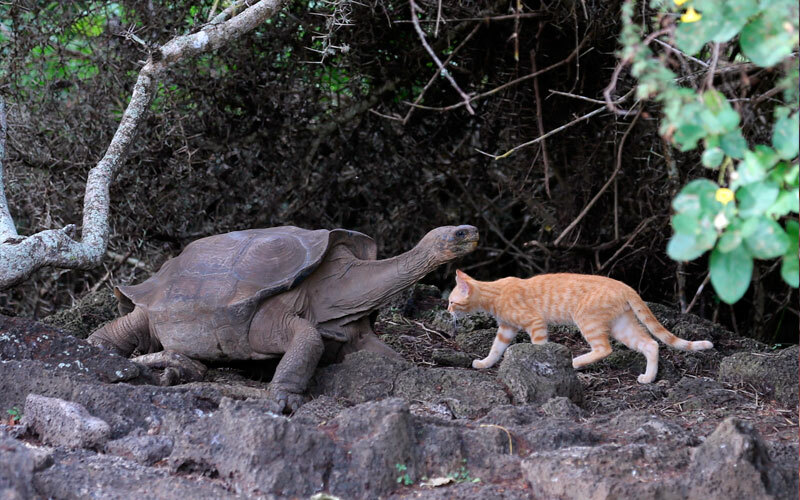 Once on the island, the reptiles took the environmental niches usually reserved for mammals: giant tortoises are large herbivores because animals like goats and horses do not naturally exist there. What do endemic species have to do with evolution? Endemic species are ones that evolved from something else. Take the marine iguana. Ages ago, some South American iguanas were washed out to Galapagos somehow. South American iguanas generally live in trees, eat plants and do not swim unless they have to. Once on the islands, the iguanas came out of the trees, developed the ability to swim and hold their breath and now eat algae. Another good example is the 13 species of Finch, all of whom descended from a common ancestor. Each finch evolved to fill an available environmental niche on different islands. Similarly, the Galapagos Giant Tortoise evolved uniquely to different islands. Charles Darwin’s careful observation of these species led to his renowned Theory of Evolution. What are some of the more famous Galapagos endemic species? The most famous reptiles include the Giant Tortoise and the three iguana species as well as lava lizards and snakes. Special birds include the Galapagos Penguin, Waved Albatross, Galapagos Hawk and Flightless Cormorant. The most famous endemic mammals in the islands are the Galapagos Sea Lions. Do the endemic species get special treatment? Endemic species, by their nature, are considered at-risk. Some endemic species, like the Galapagos Petrel or Floreana Mockingbird, have such low numbers that researchers count individuals. The Galapagos Pink Iguana only lives on one volcano on Isabela Island: should that volcano erupt, the population might be wiped out. Endemic species are therefore protected with a number of programs: sea lions are monitored, penguins and cormorants are counted every year, and hawks are tagged. Scientists and park rangers are doing their best to preserve endemic species so that nationals and visitors alike can continue to enjoy the observation of these fascinating animals. Ask any Galapagos Islands naturalist, scientist or park ranger what the biggest problem facing the islands is, and he or she will likely tell you that it’s the threat posed to local wildlife by invasive species. 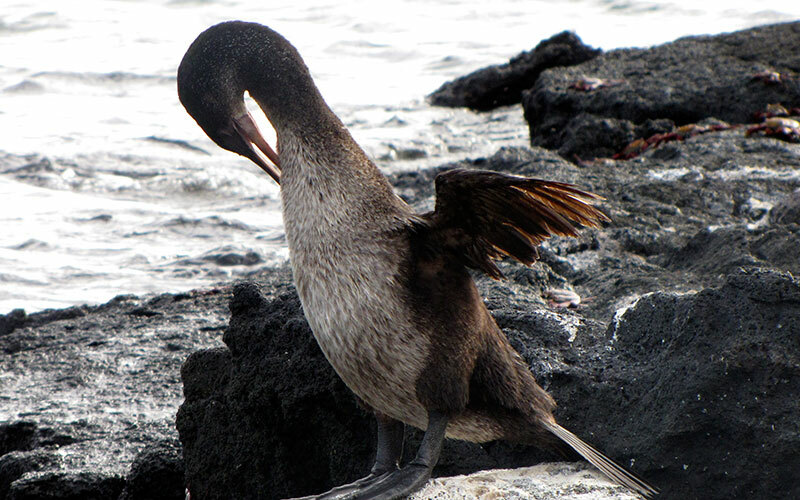 Park officials, scientists and concerned citizens of the Galapagos Islands have spent fifty years battling these species, usually without much in terms of results. Recently, however, significant gains have been made in the fight against introduced species in the Galapagos Islands. The Islands, undiscovered by man until the sixteenth century, were remarkable for their remoteness and isolation, turning them into a true “laboratory of evolution” where limited numbers of species in small, distinctive habitats could be easily studied. Before they were discovered, visited and colonized by man, new species arrived in Galapagos about once every century. In the last 300 years or so, dozens of non-native plants and animals have reached the remote islands. Sometimes they were introduced on purpose, such as cats, dogs and goats, and sometimes they arrived by accident, such as rats coming off an anchored ship. These species are often harmful to native species. 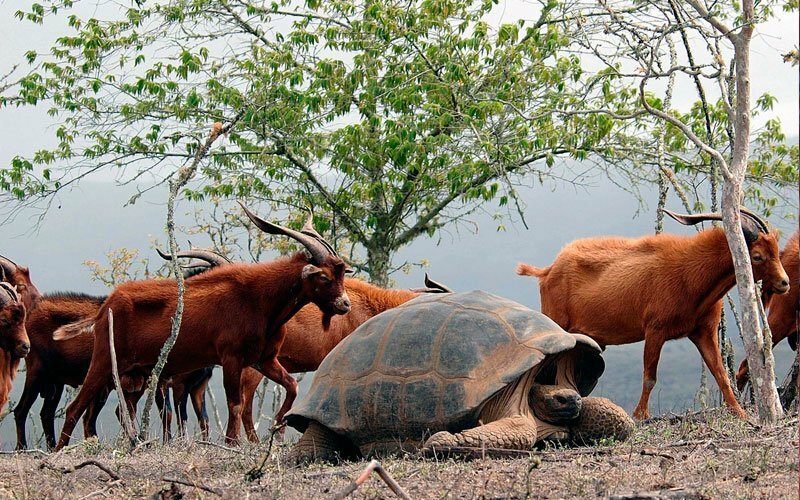 Introduced goats eat the same vegetation as giant tortoises. Aggressive rat species muscled out the hapless Galapagos Rice Rat. Introduced blackberry bushes, brought as a food source by early settlers, now grow wild over huge areas, choking native plants. One of the most persistent introduced pests in the Galapagos Islands has been the Cottony Cushion Scale (Icerya purchasi), which has been present in Galapagos since 1982. This insect eats many plants, both invasive and native, and is particularly hard on citrus trees. It is affecting several Galapagos plant species considered endangered, so its removal or control is a high priority. In order to control the scale, an Australian ladybug called the Vidalia Beetle (Rodolia cardinalis) was introduced in 2002. Last month (February 2010), the Charles Darwin Foundation released the results of a three-month study done at the end of last year on the introduced ladybugs and their effect on the Cottony Cushion Scale. The results are very positive. The ladybug has been eating the Scales, reducing their impact on local plant life. The biggest worry about introducing the Vidalia beetle was that it would feed on native insect life, but this does not seem to be the case: apparently there are enough tasty scales to go around. It seems some plants are still more affected by the scales than others, and the study is ongoing, but overall the results are very encouraging! Observe these amazing endemic species with your own eyes! Visit the Islands the way Charles Darwin did and see the amazing wildlife. 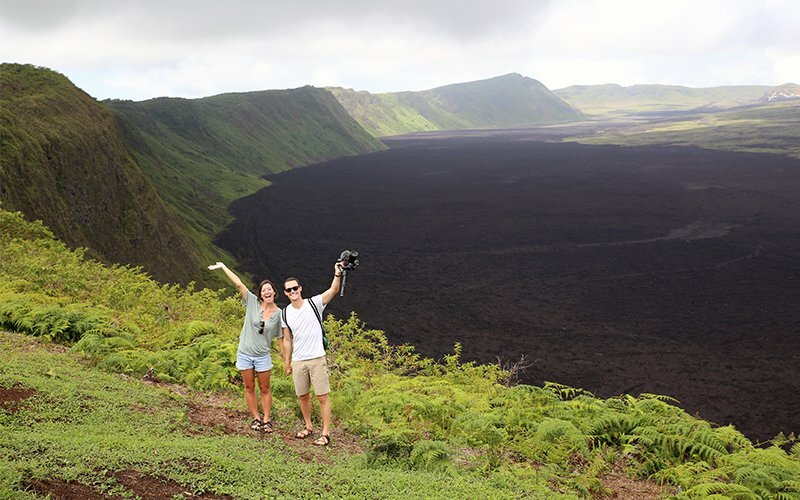 Contact one of our professional trip advisors to start planning your Galapagos adventure now! What is the Best Time to Visit the Galapagos?